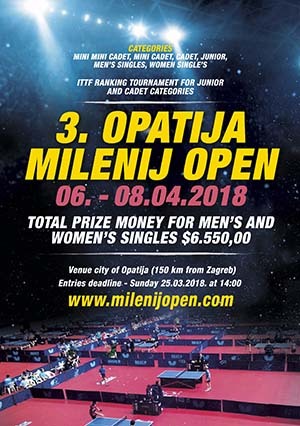 Organised by the Croatian Table Tennis Association in liaison with the Opatija 08 Table Tennis Club, the 2018 Opatija Milenij Open will be staged from Friday 6th to Sunday 8th April. A total prize fund of US$ 6,550.00 is on show with Men’s Singles and Women’s Singles events being staged in addition the competitions in the Junior and Cadet age group categories. Opatija is a coastal town on the Adriatic Sea known for the splendour of its location, it is situated 150 kilometres from Zagreb; for those who compete in the 2018 ITTF Challenge Croatia Open to be held from Tuesday 10th to Saturday 14th April, transport can be arranged from Opatija to Zagreb.